The Dell Inspiron 15 7537 Owner's Manual has been published by dell official website. For owner of this laptop and maybe you want to upgrade the hardware, so you must read this manual. 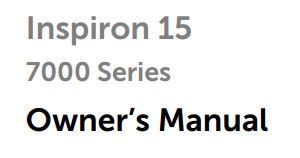 The Dell Inspiron 15 7537 user manual available in english languge, espanol, Français, and more. Many information of this manual for example tutorial about removing the battery and memory, then replacing the hard drive, flashing the bios, etc..